5 REASONS WHY I LOVE MY TALKING WATCH - NO. I'M NOT MAD. IT DOES TALK. As some of you may remember, a few weeks ago I had to have another corneal transplant because one of my eyes came down with a second dose of keratoconus (click here to read about that). But don't worry; I'm slowly getting better. So much so in fact, that I would now like to thank my mates over at watchshop.com for giving me a present prior to my surgery! Well, to cut a long story short, as soon as they found out that I was going to have an operation, they kindly gave me a talking watch from Lifemax to aide me during my recovery. I'm currently wearing an eye patch over my operated eye and both of them are starting to feel the strain due to the imbalance in my vision. Now with a little luck, eventually all of this will sort itself out -- touch wood, kiss the blarney -- but trust me when I say that in the meantime, I'm going to need all of the help I can get. 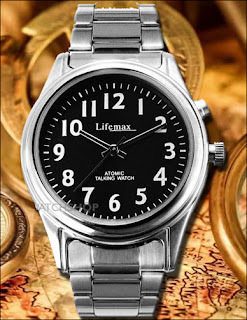 1) It doesn't look like a watch for a disabled person: Well, let's face it! In today's cosmetic society nobody likes to be labelled with having an ailment, especially if it can be avoided. 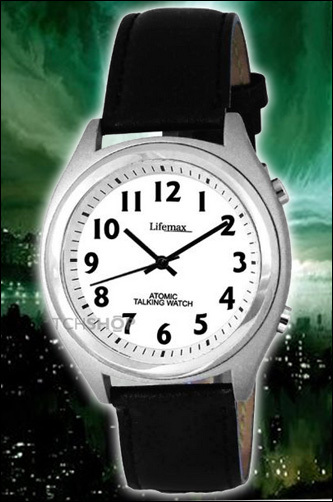 So somewhat astutely Lifemax have developed a number of different talking watches that look like watches, and not like a small speaker mounted onto a plastic strap. From the looks of it (no pun intended), they have a fairly nice range available, with each model either having a metallic strap, a leather strap, a black face, or a white face [please enter Al Jolson reference here]. 2) They're very handy if you take regular medication: After my op, the doctors told me that I needed to take a number of different eye drops over the course of the day. Some eye drops I had to take four times a day, other eye drops I had to take six times a day, and so on, and so forth. So now that I have a talking watch that, you know, actually talks, it was pretty easy for me to remember to take them when the clock ticked onto the hourly chime. 3) You can find out what the time is without looking at your watch: Another condition my eyes have contracted is an ailment called blepharitis. Now this condition causes my eyes to produce the wrong sort of tiers which makes them feel sore, irritable, and generally not nice to live with. So to counteract these side-effects, I use a warm compress, also called an eye bag, which I place upon my eyes for a ten minute duration until they feel better. Another piece of kit I use to help me with this, is -- yes, you guessed it -- the talking watch, which I use to monitor how long I have the eye bag on for. One simple press of a button and it tells me the time. 4) I will never need to change the time again: Yeah. I'm not kidding. According to Lifemax, each of their talking watches has a facility that automatically adjusts the time without you having to. This includes when the clocks go forwards in the summer, when the clocks go backwards in the winter, and even if you go on holiday the watch knows where you are and changes the time accordingly. 5) You can play games with your watch: During my convalescence I got pretty board lying around in bed, as I just bided my time by sleeping, scratching, snoring, and God knows what else. 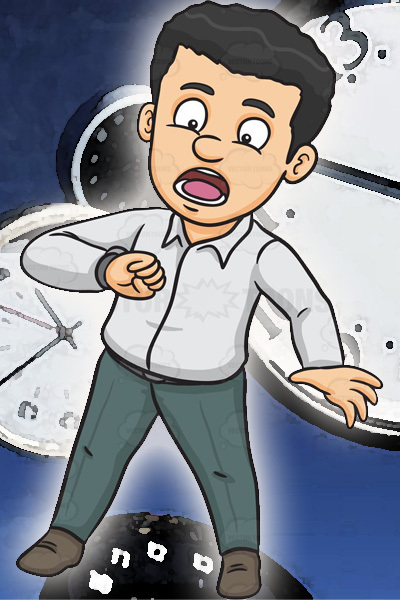 So to make the time flow a little faster, I decided to play about with my watch, beep-beep! One of the games I inadvertently came up with involved me asking it questions and then pressing a button to find out the answer. A good example of this would be when I asked my watch, 'What time is a good time to eat chocolate? ', and funnily enough, as soon as I pressed the button that told me the time, it told me the same time that was on the display, hence, me eating a lot of chocolate and burping. 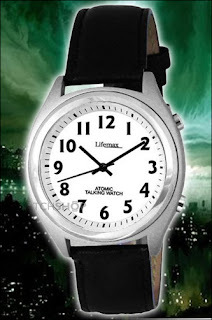 So there you have it, folks: Talking watches by Lifemax. When you can, please feel free to pop on over to the watchshop.com and see for yourself what I'm talking about. If you have bad vision like me, I'm sure they're worth a quick look.